The Blogus premium wordpress theme is perfect for a world travelers. You can share travel experiences using the Google Map feature built-n the theme. Post, add photos and communicate with friends and family around the world, keeping in touch with them while you travel. 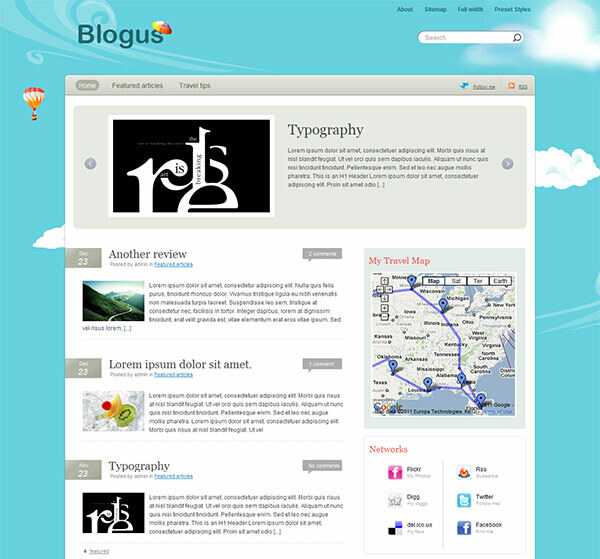 The Blogus theme has a Featured articles rotator lets you scroll the posts from Featured category without refreshing the page, a Google Map feature that lets you add your travel map or current location, a networks widget with all popular social networks in order for you to stay connected, a completely widgetized sidebar with custom widgets included in the theme packaging, completely CSS color controlled, offering you the most flexibility and the easiest customization, allowing you to change the colors of your entire site on the fly in seconds, amazing typography styles, 14 configured ShortCodes, 8 custom widgets as well as 4 different styles to choose from. Oh and a moving background while you scroll the page to top it all.